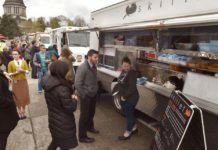 Food trucks are springing up at the intersection of 4th Avenue and Plum Street in downtown Olympia. 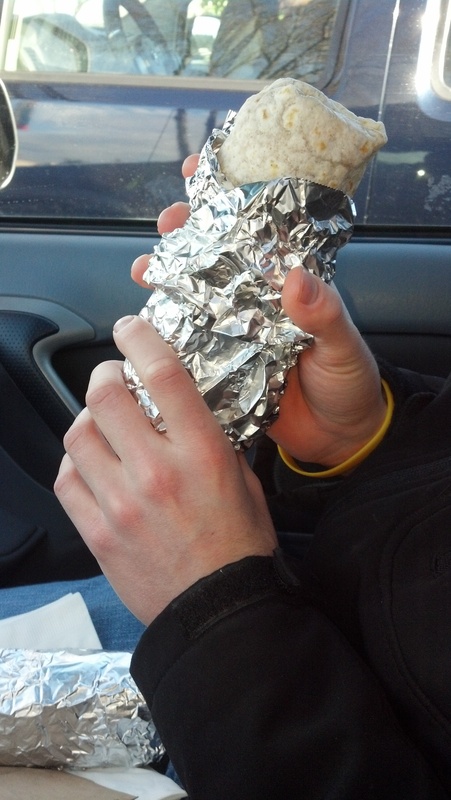 A Taco California burrito can satisfy even the biggest appetite. Breathe our glorious Pacific Northwest air. Spending a few minutes outside each day will get your blood flowing and give you first hand information about the weather. It’s really not raining all the time. You might be able to walk from your downtown office or from wherever you were parked for your downtown errands. There are a few free, off-street parking spaces between the food trucks and The Filling Station Espresso. Alternatively, press the meter button and get 15-minutes of free parking, long enough to place your order. 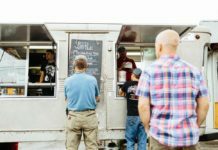 Read the posted menus while you walk around the trucks, thus augmenting your appetite. Share picnic table seats with other diners. Get your bite of Mexico from Tacos California (360-870-9032). Just saying their name gets my son smiling. He said their burrito is “big enough for one lunch plus a snack,” but I noticed that his burrito did not survive long enough to eat any of it later. My veggie burrito was nicely merged flavors of grilled onions and peppers. My leftovers provided his snack – nice of me to share. Nineveh was once a city of Assyria (more ancient times) but now it’s painted on the side of one of the trucks. At Nineveh Assyrian (360-513-7072), you discover Middle Eastern dishes like falafel, shawarma and tabouleh. My pita, called the sabich, was packed with fried eggplant, organic hard-boiled egg, hummus, amba (pickled mango) and topped with fresh vegetables. You could substitute potato for the egg for a vegan option. Stephanie Scott, assistant baker for Abby’s Cookies and Cupcakes, operates a popular sweet stop after a hearty lunch in downtown Olympia. Truly out of the ordinary, I appreciated the various tastes and textures of this ‘sandwich.’ Though not a fan of garlic fries, we did order the hand-cut fries. They turned out to be wedges of potatoes – crisp and warm – that came with a garlic aioli that reminded me of tzatziki without the cucumbers. The sauce was excellent on the sandwich, too. I have become a fan. When I indulge in treats, I expect fresh and real ingredients. That’s what they use at Abby’s Cookies and Cupcakes (360-561-9413). All made from scratch with no artificial flavors, colors and no shortening (that means there’s butter), you won’t find a bad choice. Yes, there are even gluten-free and vegan options from which to choose. Their goodies are also located the Co-op, Tofu Hut, Bayview Thriftway and the Hands On Children’s Museum. 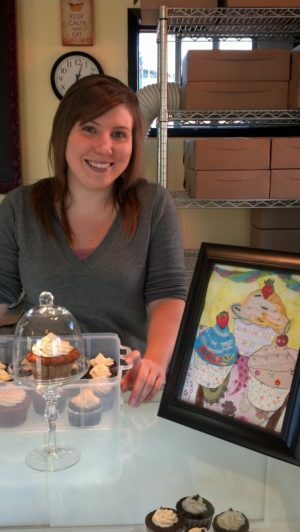 Owner Abby Mondau is happy to fill your order for weddings, baby showers and any other sort of party. On an exciting note, Mondau and her team are working on opening a new cafe in the south Capital neighborhood this spring. We love our coffee in the northwest. Once a real gas station, The Filling Station Espresso (360-754-8415) handcrafts beverages. You can go decaffeinated, if you please. Walk up or drive through. Support the local economy – even on Sunday. Ian Shulman, owner of All Fed Up, believes in food that is simple and clean. 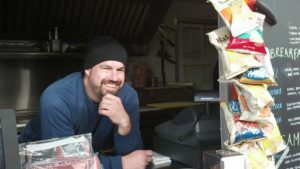 Ian Shulman, owner of All Fed Up (360-464-5757), believes in food that is simple and clean. Trained at the Le Cordon Bleu College of Culinary Arts in Portland along with his wife Angela Isaacson, they like being part of the community. Using fresh, local and organic ingredients, All Fed Up will fix you a stellar breakfast burrito (can be eaten for any meal) or sandwich. You will also find soup on tap. Shulman realized it was challenging to find a quick breakfast on Sunday, so he is there to serve you. My stomach was happy to get fed that cold Sunday morning. Don’t fret about the weather. The enclave with numerous edible possibilities will warm you up. Yes, some days you’ll want the comforts only a dine-in restaurant can deliver, and that’s to be expected. But in-car dining on a blustery winter afternoon is its own kind of picnic. The day after our lunch I was reminded of our dining pleasures as the scents floated out of my car as I opened the door. They surrounded me as I settled into the driver’s seat. I inhaled deeply, remembering that life really is delicious.